Unlike many babies, who recognize the sound of their parent’s voice and enjoy music early on in life, Camden entered a silent world. Being born deaf comes with unique communication challenges that make learning new concepts and building relationships difficult. Camden first began to interact with the world of sound as a 13-month-old, after he had surgery to receive cochlear implants in both ears. Unlike a hearing aid, cochlear implants don’t amplify sound. Instead, they pick up pieces of sounds and turn them into electronic signals to feed to the brain. Hearing through a cochlear implant takes practice and patience. Camden would need to learn how to piece together the auditory puzzles he heard each time someone spoke to him. Camden’s dad, Murph, recalls that being completely deaf early on in life placed Camden far behind his peers and his potential for communication. To make the cochlear implants more effective, Camden had his middle ear removed on both sides. The middle ear affects the ability to balance, so Camden needed therapy to help him move safely throughout his daily life. Camden’s parents chose ChildServe because the team of specialists offered coordinated support under one roof for all of Camden’s needs. He could receive occupational therapy to improve balance and coordination, speech therapy to build his communication skills, and his parents could receive support, guidance, and resources from ChildServe’s cochlear implant specialists. At 18 months old, he began meeting licensed therapists at ChildServe for 30 minutes twice a week in both speech and occupational therapy. When he started at ChildServe, Camden knew how to say just one word at a time and had very limited vocabulary. After working through many hours of speech and occupational therapy, Camden has graduated out of his occupational therapy sessions. While he continues speech therapy, his parents are amazed at his growth, especially in his ability to carry on a conversation. Camden’s parents also found support through ChildServe while working to create an Individualized Education Program (IEP) for him through the AEA. 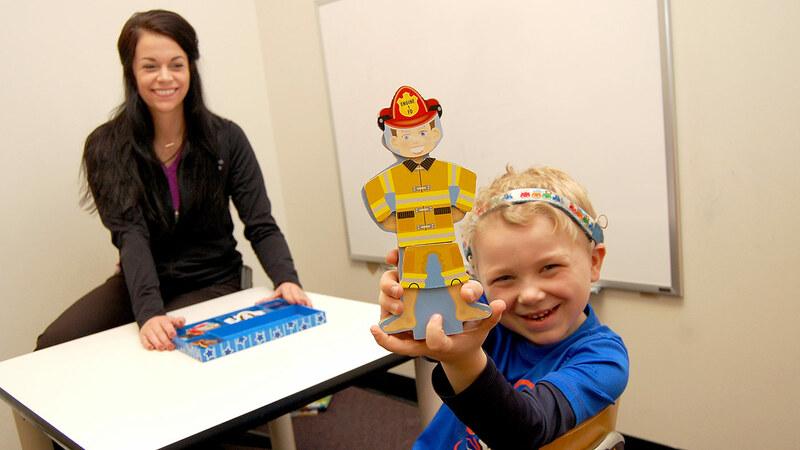 Kayla Orthmann, a Speech Therapist at ChildServe, meets with Camden twice a week. She incorporated the SPICE curriculum into Camden’s therapy sessions after a donation from the Scottish Rite enabled ChildServe to purchase the curriculum. His parents observe the sessions through a two-way mirror to gain insight and watch his progress, and Kayla informs them about techniques they can use at home to improve his communication skills. Kayla has seen Camden grow across a large range of speech, language, and hearing skills. However, one of Camden’s improved skills stands out as important for all kids with cochlear implants: the ability to speak up for himself regarding his cochlear implants. Camden’s parents agree that the most rewarding part of his growth has been watching him become more confident.